A single depression from a larger sinuous chain of pits located at 34.6°N, 43.5°W in NAC frame M102443238R. 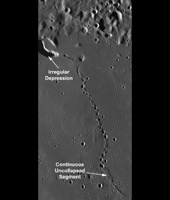 Image is 1.5 kilometers wide and light is incident from the left at an angle of 78°. 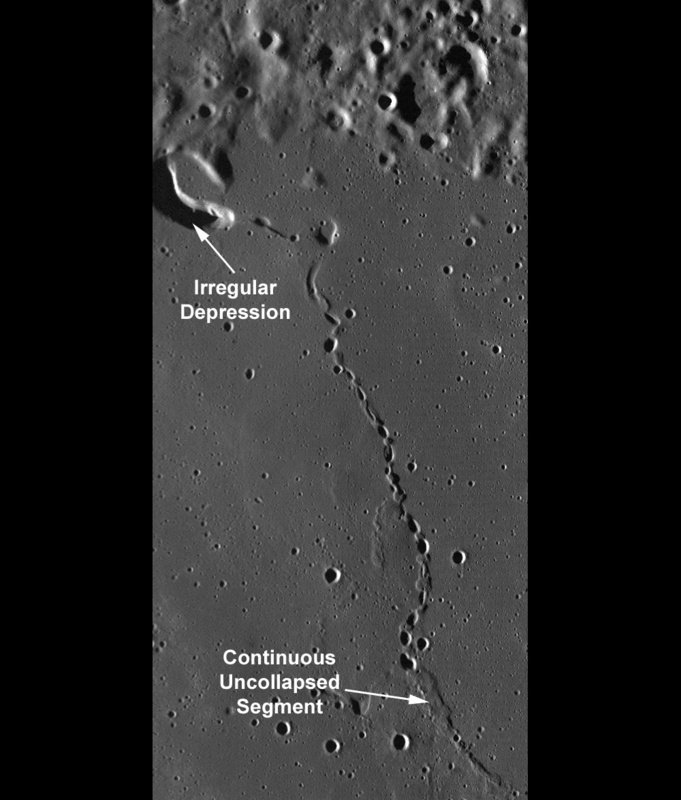 This unnamed sinuous chain of pits was suggested to be a collapsed lava tube (see Wilhelms' Geologic History of the Moon). New high resolution NAC images (e.g., M102443238R) provide a new look at the area. This particular feature transitions from a discontinuous sinuous rille into a wrinkle ridge. Some scientists have suggested that wrinkle ridge faults interact with lava tubes, with the wrinkle ridge exploiting a zone of mechanical weakness (the lava tube) in the preexisting basalt deposit. In this NAC image, the topographic depressions are non-circular, with collapse rims. Many of the pits have boulders on the interior walls. If these depressions were created by impacts, each pit would have a raised rim and an ejecta blanket.